Sri City, January 10, 2019:- The Southern India Chamber of Commerce and Industry (SICCI), non-government, not-for-profit, industry-led and industry-managed organisation, whose primary function is to work for the development of industries in South India. proposes to open its new chapter in Sri City shortly. Mr. R. Ganapathi, President, SICCI accompanied by Mr. S. Raghavan, Secretary, SICCI visited Sri City on Thursday and discussed with Mr. Ravindra Sannareddy, Founder Managing Director, Sri City about the prerequisites for a formal launch of the SICCI-Sri City Chapter. 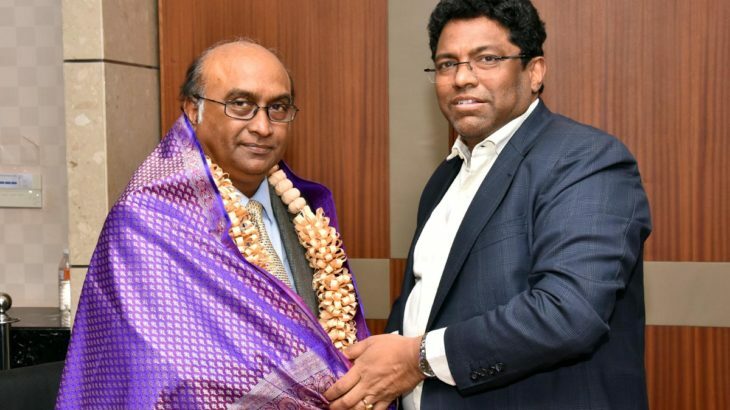 Thanking the executive committee of SICCI for choosing Sri City to start its new chapter, Mr. Ravindra Sannareddy said, “SICCI has been around for more than 100 years as a vibrant apex body of several business houses in South India. Industries in and around Sri City looking to keep pace with the swift developments in corporate world can henceforth count on the expertise of SICCI”.